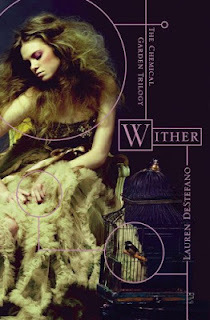 Lauren DeStefano's Wither is the first book in a while that has captured me and made me ignore everything else to finish it. What a fantastic feeling. In a dystopian future where men die at age 25 and women die at 20, Rhine has been kidnapped and forced to become a sister wife, sharing her husband and plotting her escape. As she forms bonds with the two other wives, she tries to keep her focus on getting back to her twin and the life she had before. At first, I found the characters to be fairly flat, each subscribing to a different stereotype. As the novel progressed, though, they developed and I became fond of them, similar to the way Rhine's feelings for her sister wives and husbands changed. If this was intentional, it is impressive. I'm excited to begin its sequel, Fever, later today. Sometimes there are benefits to being behind in my reading!